Disability forms are produced to seek benefits and exemption in various processes for the disabled people. It is necessary to prove their disability and that is why this form is filled up where an applicant gives his/her details regarding the disability to apply for the benefits that he/she is entitled to. The form has a wide application and it is mandatory in government offices, colleges and other government sector. 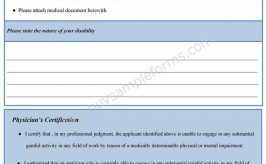 Sample medical disability forms contain information regarding a person’s medical disability. Though the form alone is not sufficient, doctors’ certificates to prove disability are also necessary to get the benefits. Another place where the disability form is mandatory is in the area of social security, especially for flying and travelling by train. There are many types of this form and one can use it according to his/her needs. For example, if a woman is pregnant and needs leave from her work, she needs to produce the pregnancy disability form that states she is pregnant. The form should be submitted along with the supporting documents. It should be crucial to fill so the applicant should give great care while filling up this form. In addition, one can also use the temporary disability form, especially when that person claims the disability benefits for his/her sudden damages. This kind of form is produced according to the law of the state and if the concerned authority denies the claim, one can even go to the legal course. Whatever the type of the form is, one must fill this form with accuracy and in case the applicant is proved offender, the legal punishment can be taken against him/her. A Disability Extension form is a document which enables a patient to draw benefits from the state or from the workplace like extended leave, financial assistance etc. The Disability Verification form must be completed by a qualified Health care professional such as registered nurse, physiotherapist, family doctor etc. The disability report update form is asked by the Government of a state to the disabled persons so as to update its records on disabled citizens who may be entitled to receive the disabled benefits. 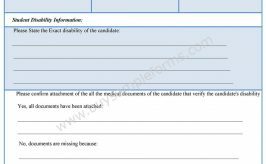 The Disability Report Appeal Form purpose is to contain information related to the patient’s disability that has occurred since the patient’s last disability report. The disability forms are used to capture essential information for evaluating disability benefits like extended leave, financial support etc. Free disability forms refer to those that are required by disabled persons and can be obtained without any charges or fees. Medical disability forms are used for receiving medical treatment from state or certain organizations. 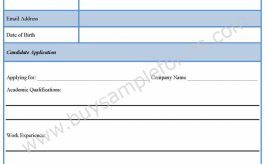 This form should contain all parameters for assessment. The Permanent Disability form is used in determining whether a person is permanently disabled or not. Student Loan Disability Form is a form through which disabled students are granted full or partial exemption from paying any educational loans. Schedule A Disability Form is used for the purpose of giving employment to persons with a severe physical, psychiatric or intellectual disability. 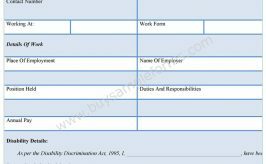 Work Disability form has to be filled by the individual who is disabled and this form is prepared by the organization where he or she is working.